There will be one winner (“Winner”). 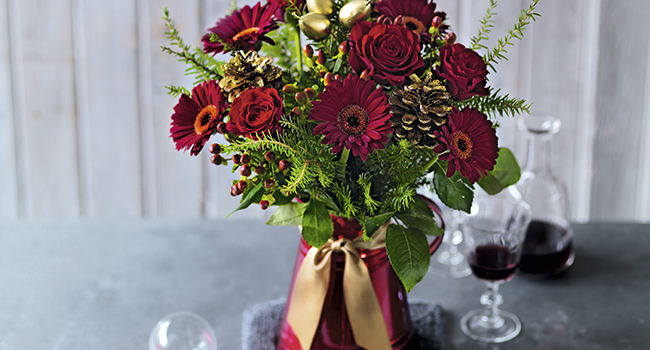 The Prize is 1x Super Red Winter Wonderland Jug for a friend, and 1x Large Festive Poinsettia Basket for the Winner. There is no cash alternative to this prize. The winner will be selected at random by a random generator from all those that commented on the post. No automated entries permitted. This competition is open to mainland UK residents only (excluding Channel Islands), except employees of the Promoter, their families, agents or anyone professionally connected with them. All entrants must be aged 18 or over. The Winner will be notified by a @mention in in the comments on the original Facebook post on Wednesday 27 November 2013 and then will engage in a conversation with Waitrose via private message to arrange the delivery of the prizes. After the announcement of the winner, the winner has 3 days in order to reply to accept their prize. After this point, the prize may be re-distributed. Publicity will be given to the competition Winner and their name and/or area and/or entry will be announced on the Waitrose Facebook page. No payment will be made for entries except the prize awarded to the Winner. Waitrose and partners accept no liability for any loss, damage or injury caused by any prizes won. All entries must be received by 16.00 on Wednesday 27 November 2013 to be considered as a valid entry into the competition. No responsibility will be accepted for any entries that are illegible, incomplete, lost or delayed in transit or which fail to be properly submitted. Proof of sending will not be accepted as proof of receipt. The promoter and their agents accept no responsibility for difficulties experienced in submitting an entry to this promotion. The Winner will be selected at random by the Waitrose Social Media Team on Wednesday 27 November 2013 from all the valid entries received by the closing date/time. Entries received after the closing date/time cannot be considered. The Promoter’s decision is final and no correspondence will be entered in to. All reasonable effort will be made to contact the Winner; however, if the promoter is unable to contact a winner within 3 days of the selection, the promoter reserves the right to select another winner from the entries already received subject to the same terms and conditions specified herein. If a winner of the prize is unable to take up their prize for any reason, the promoter reserves the right to award it to an alternative winner, in which case the first winner chosen will not be eligible for any share of the prize whatsoever. If events occur that render the promotion or the awarding of the prizes impossible due to reasons beyond Waitrose’s reasonable control, it may, at its discretion, vary or amend the promotion accordingly and the promoter reserves the right to provide an alternative prize of equal or greater value in such circumstances. The promoter reserves the right to terminate or temporarily suspend this promotion in the event of technical or other difficulties that might compromise its integrity. This promotion and these terms are governed by English law and subject to the exclusive jurisdiction of the English Courts. Waitrose and Manning Gottlieb OMD are responsible for the promotion, which is the publication and adjudication of the competition. We will never release your personal details to any company outside the John Lewis Partnership for mailing or marketing purposes, unless you opt-in to receive information and offers. In this instance, personal details are used for the purposes of awarding the competition prizes only. The promotion is in no way sponsored, endorsed or administered by, or associated with, Facebook. You understand that by entering the competition you are providing your information to Waitrose and not to Facebook. You must comply with all of the rules regarding the use of Facebook including but not limited to any rules relating to the entry of promotions on Facebook. By entering the promotion you release Facebook from any action or claim arising out of the promotion. Any questions, comments or complaints regarding the promotion must be directed to Waitrose and not Facebook.